By Jessica Diemer-Eaton. Originally Published on Yahoo! Voices in 2011, republished by the author here October, 2014. Acorns, beechnuts, black walnuts, butternuts, chestnuts, hazelnuts, and hickory nuts were among the nuts consumed by Woodland Native Peoples. Before the coming of corn (about 1,000 years ago), even at the dawn of plant domestication in the East (about 4-5,000 years ago), nuts played a pivotal role in the diet and good health of the Indigenous Peoples here. However the nut never lost its relevance even when a high corn diet was fully adopted. The hickory tree was prized for its sweet tasting nuts. The name "hickory" is Native American in origin, the present term created by early Europeans shortening the Virginia Indian word "pawscohicora." A proto/post contact site in Virginia revealed a diet based predominantly on corn and hickory nuts. Indeed, it was noted historically to be a favored nut among many Native communities, but in order to make the harvesting and processing of such in large amounts feasible, the Native People employed an ingenious method of shelling the nuts. The following Delaware (Lenape) process was clearly noted in the 18th century: They put handfuls of nuts in a mortar (probably a large wooden corn mortar) and with a heavy pestle, cracked the nuts open, all while adding water. When a sufficient amount of water was added to the cracked nuts, it was stirred so the nut meats separated from the shells, at which point, the meats and shells being different materials in the water, one floated to the top while the other sank to the bottom (this method focuses on making a hickory nut milk while separating). Another method calls for the cracked, un-separated nuts to be thrown into boiling water, during which the heavy nut meats were suspended in the liquid as the light shells were carried to the top with the current of the boiling water. If the nuts were left longer with no rapid boil, the waterlogged shells fragments sank to the bottom. Using these methods, the Native Peoples were able to process larger amounts of nuts with less energy and time devoted to it. The water in which the shells were separated was used as soup broths and beverages. If nut oil was desired, it was said the meats were ground and boiled, to separate the oil and bring it to the top of the water where it was skimmed off. Hickory and butternut oils were noted by the Iroquois to be especially pleasant in flavor. They also fed the nutritious and fatty hickory oil to their infants. The pulverized boiled meats were dried for later use, or used right away in breads and puddings. The Iroquois took hickory and butternut meal with ground dried bear or deer meat, and boiled the mixed powder to create a liquid baby food. Another well-liked nut, the black walnut, was also used to make liquid baby foods. In New England, Native parents boiled the crushed walnuts, cornmeal, and water to produce the pap. Sometimes, squash was added to this recipe. The Cherokee are noted for their traditional dish kanuchi. Kanuchi was made by grinding the nuts and forming into balls which could keep for a short time. Many insist most the nut shells are removed (with exception to some of the thin woody interior pieces) as later straining would insure no shells would be left in the dish. When kanuchi was desired, the ball was dissolved in warm or hot water and brewed. If strained, this was the time to do so (and larger chunks of nut meats could be picked out and added back to the hickory broth if desired). It could then be simmered and brought to a thicker consistency. It could be consumed as is or serve as the broth-base for other ingredients, such as hominy. According to the official Cherokee Nation website, an 1835 document indicated that although such a brew was in use earlier among traditional Cherokee, the hickory broth was actually made with cool water and consumed as a drink. Whether or not the kanuchi known today is a more recent adaptation of this earlier drink, this author finds it hard to believe it wasn’t included as an ingredient in hot dishes. After all, many Eastern Native folks are noted for consuming vegetable and meat broths both as soup and as a drink. Butternuts, also known as white walnuts. 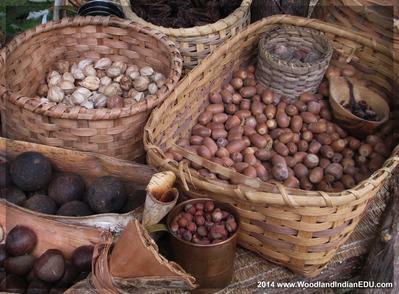 The starchy but protein-rich American chestnut was also a staple of the mid-Atlantic and southern New England tribes. Said to be easily harvested and the taste very sweet, it is no surprise that one 17th century observer claimed chestnuts to be the Native Americans' white bread. Indeed, chestnut meal was used in making breads and puddings. Not always utilized as a flour, and in fact, most often these nut meats were said to be consumed whole or in chunks. In southern New England, boiled chestnuts and berries were usual ingredients added to corn pudding. Acorns, hickory nuts, walnuts, chestnuts, and hazelnuts. And while many today crave roasted chestnuts during the holidays, most have probably never thought of roasting acorns. Indeed, that was just one way the Ojibwa enjoyed their acorns, roasted in the fire's ashes. Other favorites included splitting the boiled nut open and consuming it as if it were a vegetable (one Iroquois story speaks to the tradition of roasting acorns, when the Flying Head was scared by a woman eating roasted acorns, thinking she was instead consuming hot coals). Or the acorns were mashed, boiled and eaten with grease. Duck broth was said by the Ojibwa to be very good in combination with acorns. Rich in carbohydrates and fats, acorns were also very abundant and thin shelled, all the more reason to utilize them. However, one problem with acorn consumption had to be dealt with - the noxious tannic acid it contained. While some like white oak produced nuts with little tannin, and could be eaten as is (at times), those with higher levels of tannin, like acorns of red oak, had to be leached before consuming. Leaching was done in either a cold or hot process. In a cold process, the nut meats (whole, cracked, or ground) are submerged in cool water, and the tannin impregnated water is changed often, or it is submerged in running water (such as a spring or creek). In a hot leaching process, the nuts were boiled and rinsed several times. Other methods may have also been employed in the east, including rinsing nut meats in a sandy pit or burring them in earth where spring water could rinse it naturally. The Iroquois also added ashes (alkali) to the water to "remove the bitterness," while some accounts by outsiders claimed the ashes helped to expel and separate the oils. Acorn meal was then mixed with cornmeal to make breads or puddings. Acorns were also enjoyed in soups, and boiled for their oil. And even though red oak acorns needed more processing than white oak acorns, their desirability wasn’t hurt among pre-contact Native Americans (as indicated by the food remains recovered in many archaeological sites). This may be due to the red oak acorns’ richness in oil and calories offered. -“Acorns and Bitter Roots: Starch Grain Research in the Prehistoric Eastern Woodlands” by Timothy C. Messner. -"History, Manners, and Customs of the Indian Nations Who Once Inhabited Pennsylvania and the Neighbouring States" by John Heckewelder. -"Indian New England Before the Mayflower" by Howard S. Russell. -"Natives and Newcomers: The Cultural Origins of North America" by James Axtell. -"Parker on the Iroquois" by Arthur C. Parker. -"Societies in Eclipse: Archaeology of the Eastern Woodlands Indians, AD 1400-1700" edited by David S. Brose, C. Wesley Cowan, and Robert C. Mainfort Jr.